Loch Ness Shores are looking forward to welcoming you. Scotland’s most famous loch is the stunning backdrop for the Club’s new campsite in the Scottish Highlands. The aptly-named Loch Ness Shores Club Site is located on the quieter south shore near the village of Foyers. This 99 pitch, all-year-round campsite enjoys panoramic views around Loch Ness to the mountains beyond and is the perfect base for exploring the area’s historic sites like the magnificent Urquhart Castle, the charming towns and villages of Fort Augustus, Cannich and Drumnadrochit, or for getting active whether it be on foot, bike or boat. The site itself has excellent eco credentials, including using innovative green technologies to heat and light the facilities which include an amenity block with under floor heating and home from home shower rooms, an on-site shop and wi-fi. Boats (suitable for fishing) and canoes are available to hire on site. Due to local planning restrictions please note that the arrival time for this site is after 2pm. The site is one of a few places around Loch Ness where shoreline access provides access to launch small boats. Activities on site (archery, den building, wildlife walks). Electric bikes, kayaks, and fishing boats with permits are available for hire. Access and SatNav Advice - Don’t use a satnavs to access this site. Approaching on the A9, turn off at the Raigmore Hospital and follow the south ring road (B8082 Sir Walter Scott Drive). Bear right in Dores on B852 to Foyers. Approximately 2 miles after you pass through Inverfarigaig, you will see a white building on the right hand side, turn right 100m further on behind the No Entry sign, which is signed for Lower Foyers and follow the signs to the campsite. 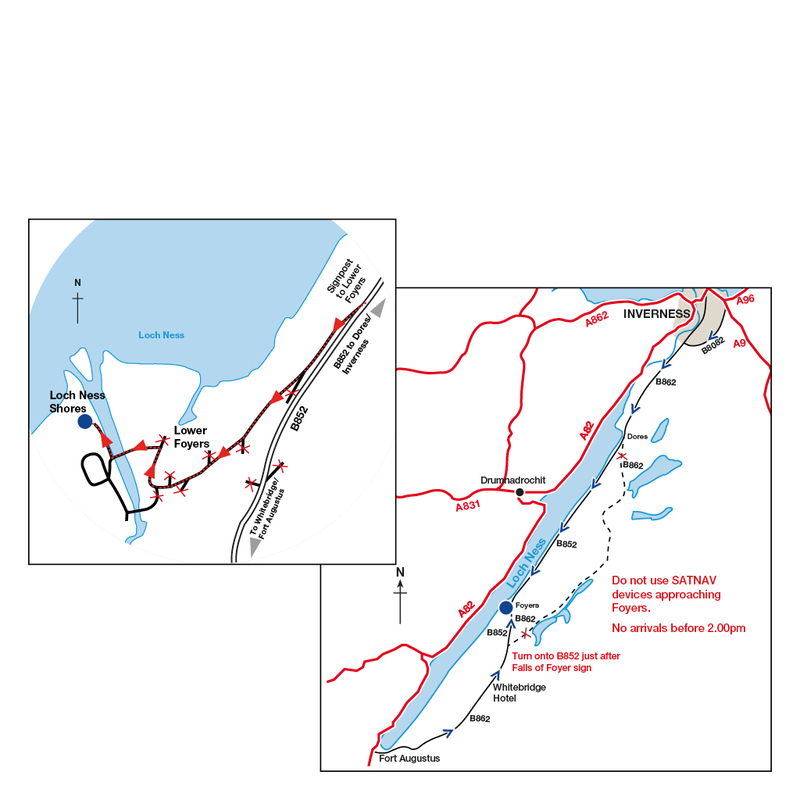 Approaching from the South, leave the A82 at Fort Augustus and follow the B862 to Whitebridge. Approximately 1 mile after the Whitebridge Hotel, turn left on B852 to Foyers. Approximately 1 mile after Foyers Stores turn sharp left to Lower Foyers and follow signs to site. WiFi is available at this site. However please note the service is supplied by a different provider therefore your Site WiFi card (powered by WiComs) cannot be used. Please contact the site direct for more information. Shop and airstream diner on site. Craigdarroch Inn, Foyers Stores, Waterfall Café and Cameron’s Tea Room sell excellent food. The Lovat in Fort Augustus has exceptional food and gives our visitors 10% discount. Don’t miss out this bank holiday weekend – book now! Opened over 30 years ago, the Loch Ness Centre and Exhibition takes you through 500 million years of history and legend. Uncover the unique environment of Loch Ness. Towering above Loch Ness, Urquhart Castle is a ruined 13th century fort on the shores of Scotland’s most famous loch. Steeped in mythological legend, folklore suggests the Loch Ness Monster lives in the hidden caverns beneath the castle. Just a short walk from Loch Ness, the Falls of Foyers is a spectacular waterfall that plummets over 165 feet. In 1787, iconic Scottish poet Robert Burns was so taken with the waterfall that he dedicated a poem to it. Sitting atop a cliff overlooking the River Ness, Inverness Castle has undergone various developments since the 11th century. Before it became the neo-Norman structure visible today, it was a 18th century citadel known as Fort George. Explore the Highlands from this peaceful Scottish campsite.